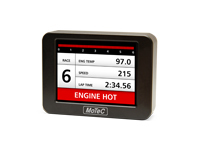 The D175 is part of MoTeC’s D1 Series of colour displays designed for use with MoTeC data loggers. 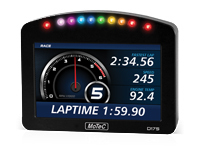 Featuring a 5 inch high resolution LCD screen, 10 programmable, full colour LED lights and an Autosport connector, it is ideal for dash mounting. Exceptional brightness and clarity make it easy to read in direct sunlight. Designed for use with MoTeC’s Colour Displays and Display Loggers, this intuitive and powerful software allows you to fully customise your onscreen graphics. With Display Creator you can maximise the potential of your high resolution display by generating layouts specifically for your application. Add sponsor logos, design your own gauges, create unique warning screens, use non-English labels and define parameters to suit your individual needs. Display Creator is free to download and comes with samples to get you started. D1 Series Displays do not require any enable to accept Display Creator files. The D153 mini colour display is ideal for steering wheel mounting.